The following document library contains all the relevant information regarding the Fishermans Bend project. The following background reports were commissioned by Places Victoria to inform preparation of the 2013 Draft Vision and Design Guidelines for Fishermans Bend. They have been prepared by experts and consider infrastructure requirements, social and community outcomes, urban context and development opportunities. Some of these are technical in nature, such as the geotechnical study or land contamination report, and report on the nature of the environment and development capability and options. Others are more aspirational and make recommendations as to strategies to manage built form, community engagement or infrastructure options. These studies were used in the development of the current Fishermans Bend Strategic Framework Plan. Each report is summarised below and can be accessed in full by clicking the relevant link. These reports do not necessarily reflect the views of the Victorian Government. 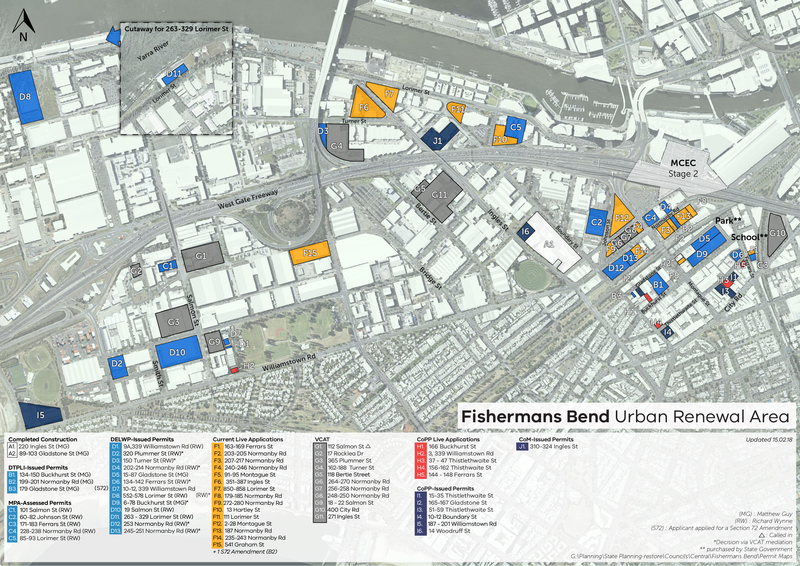 The report reviews the community engagement for the Fishermans Bend Urban Renewal Area undertaken by Places Victoria in 2013, and details the responses. This report was used extensively in the development of the Fishermans Bend Strategic Framework Plan. The Community Infrastructure Plan addresses the opportunities and challenges of delivering community infrastructure and open space in an urban infill setting by recommending a new approach that departs from a traditional ‘Growths Areas’ model of provision. The Utilities Infrastructure Plan develops two broad strategies for servicing Fishermans Bend. It details targets and objectives associated with each, cost estimates and governance and funding strategies. Undertaken by Parsons Brinckerhoff to identify feasibility options for providing an arterial connection between Graham St and the Prohasky Street/West Gate Freeway ramps intersection within the Wirraway Precinct of the Fishermans Bend Urban Renewal Area. The study finds that options involving deep excavation are likely to encounter contaminated land, acid sulphate soils and groundwater which would significantly impact the construction cost of these options. Parsons Brinckerhoff recommended a combination of options to be chosen as the preferred arterial road route and developed further at a feasibility design stage. This report helped inform the street network set out in the Strategic Framework Plan, and provides the background for work with the EPA and councils in determining how new roads area to be safely constructed in the context of contaminated soil and groundwater. Aurecon’s feasibility study into the extension of Melbourne CBD tram services into Fishermans Bend identifies a number of alignment options, which include operating costs, number of stops, route length and journey time. Five options are identified, four of which include the construction of a link over the Yarra from the CBD, and one which extends on the existing 109 light rail line. This study, alongside significant planning work with the former Department of Transport, Planning and Local Infrastructure, provided the basis from which the current preferred tram route option shown in the Strategic Framework Plan was selected. GHD investigates existing traffic demand in Fishermans Bend, and examines the volume of traffic which currently exists during a 7am-7pm cycle. The study finds that the vast majority of vehicles are cars, with Montague Street recording the highest volume of traffic in both directions while Cecil Street recorded the lowest one-way traffic volume of any site. Most heavy vehicles were noted to be travel westbound on Williamstown Road. The data suggested that Plummer Street acts as an alternative truck route and assists in reducing the volume of east-west truck movements along Williamstown Road. The majority of trips within Fishermans Bend are ‘through trips’ with a small proportion of local trips. Plummer Street has been identified as the Civic Boulevard in the Strategic Framework Plan, working with VicRoads and the former Department of Transport, Planning and Local Infrastructure. This strategy will limit its use as a freight route, and distributing heavy vehicle traffic away from the future high-density residential area in line with strategy outlined inVictoria: the Freight Stateand the Port Capacity Project. The Strategic Framework Plan also aims to develop Fishermans Bend as an active, sustainable community, through introduction of initiatives to decrease vehicle use, and extensive walking and cycling infrastructure. A commissioned study into route options for a Principle Bicycle Network (PBN), and concept designs for five key corridors and two intersections for the Fishermans Bend Urban Renewal Area. Included in the report are the identification of corridor options, selection of preferred cycling treatments, selection of preferred pedestrian and cycling treatments for two key intersections and development of concept designs for the preferred facility treatments. The key intersections identified are Wurundjeri Way/Lorimer St/Montague St/West Gate Freeway and the Clarendon St/Normanby Rd/Whiteman St intersection, with respective treatments identified by GTA. The corridors identified are Lorimer St, Waterfrontage Corridor, Docklands/Domain Connection, South Melbourne Market Precinct and Bay Street Precinct. Biosis Pty Ltd examines the Historic Cultural Heritage context of the Fishermans Bend Urban Renewal Area. The study identifies a number of sites of heritage significance, both on the existing heritage registers and others considered to be of heritage value. 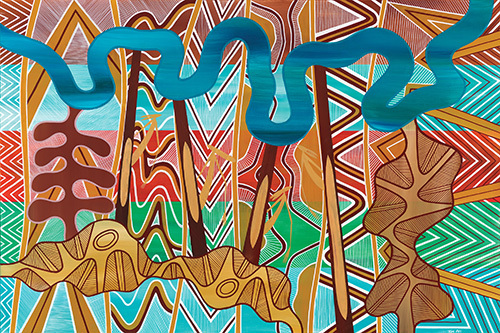 Fishermans Bend is predominantly a mix of nineteenth and early twentieth century low scale residential, commercial and industrial developments but has some sites of potential ‘Aboriginal Archaeology’ significance from its historical role as an Aboriginal settlement. The study outlines a number of recommendations which deal predominantly with respecting the Historic Cultural Heritage setting in designing adjacent buildings, and also lists 12 sites for further investigation with a view of potentially adding them to the heritage register or protecting their with planning controls. This study informed Objective 3.9 in the Strategic Framework Plan Design Guidance. It also suggests that a planning scheme amendment introduce specific sites into the Heritage Overlay; council has the opportunity to undertake this process. The historical account produced by Biosis Pty Ltd for Places Victoria outlines a general historical record of the Fishermans Bend Urban Renewal Area, and provides a basis for the heritage study undertaken at the same time. The study outlines a comprehensive historical record from original Aboriginal settlement 40,000 years ago through to colonial settlement and up to the rezoning of the land by the former Minister for Planning in 2012. This study has provided the Historic Cultural Heritage background that will further inform local precinct planning. GHD identifies and reports on the existing relevant known default amenity buffers and barriers internal to the Fishermans Bend Urban Renewal Area and within the surrounding area. The study focuses on indentifying risks to future development of the area as well as the impact of the introduction of sensitive uses on existing industrial uses and what negative amenity effects the existing uses may have on future sensitive uses. It also identifies a number of potential mitigation measures and identified potential future planning scheme measures that may be needed to mitigate these effects. As part of the report GHD makes a number of key recommendations which include contacting key industries and the Environmental Protection Authority to understand the limitations of development better, as well as recommending that in depth odour/dust and noise/vibration studies be undertaken prior to development staging. Judith Stubbs & Associates’ Affordable Housing Paper provides a background on the potential and need for affordable housing in the Fishermans Bend Urban Renewal Area and details a number of options for its delivery. The paper aims to provide legally accurate, economically feasible, politically acceptable and sustainable options for the delivery of affordable housing as well as to provide a strong evidence base for the future development of an Affordable Housing Strategy. The paper promotes inclusion of public housing in order to increased mixed demographics and vibrancy in the area. Four options are suggested, which identify different percentages of target groups. The options include planning interventions and subsidies as well as an option for ‘business as usual’ which sees housing delivered by the market with no intervention to create affordable housing. This paper informs the current research into floor spaces ratios and associated development bonuses. It also ties in with the government’s aspiration for the introduction of inclusionary zoning on government-owned land in Fishermans Bend. The SGS Economic & Planning study of the economic and employment context of the Fishermans Ben Urban Renewal Area identifies the significance of the local economic and labour force and level of importance it has in relation to Melbourne CBD. The report profiles the economy of the area and the existing land use in order to better understand the implications of development in the area. SGS utilises a variety of self-generated data as well as publically available council and census data including ABS and CLUE database utilization. The findings conclude that Fishermans Bend represents a significant manufacturing/logistics hub in the Melbourne statistical division and is home to businesses of state significance while employing a large number of people. The report notes that employment in manufacturing and transport has declined in the past decade and site contamination and drainage hinders further industrial development. SGS also makes a number of recommendations including suggested development opportunities for each precinct. Findings of this study has been utilised in identifying prospects for retention and growth of important existing industry, in the recognising those industries appropriate to assist in transitioning from the area, and in determining the significance of opportunity in extending the Melbourne CBD over the Yarra River to the Port Phillip Bay. AECOM Australia’s study into the transport context of the Fishermans Bend Urban Renewal Area is informed by four future development scenarios across the short, medium and long term time scales. AECOM found that the existing transport network currently falls short in providing good levels of access by walking, cycling and public transport for long and short trips associated with central city type urban environments. A number of recommendations are made which include implementing a Travel Demand Management Strategy, investigating traffic conditions to determine current use, develop a fine grained pedestrian network and end trip facilities for cyclists, as well as major pieces of tram and train infrastructure in the long term. Integration with other major activity centres and nodal points across the city is identified as critical. This information informed the MPA’s approach to sustainable modes of transport in Fishermans Bend, embedded in the Key Elements and Design Guidance in the Strategic Framework Plan. Golder Associates’ report assesses potential contamination issues within the Fishermans Bend Urban Renewal Area and provides an assessment of risks and costs associated with these issues as well as mitigation strategies. The findings suggest that widespread land filling of the previously swampy terrain with waste soils and industrial material occurred in the late 19th century and early 20th century. Most of the precinct land parcels were categorised as medium risk which indicates moderate contamination, with a lesser extent of land assigned low or high risk rankings. Some of the high risk sites will require soil remediation and possible groundwater remediation. There are two identified former landfill sites adjacent to Todd Road and within the Plummer St Precinct. The report indicates a number of recommendations based on the severity of contamination and provides benchmark estimates on costs of remediation which vary from <$1m/ha for low risk to >$6m/ha3 for high risk. This study provided the impetus for the EPA study commissioned by MPA which further explores groundwater and soil contamination, and options for remediation. Golder Associates prepared a high level geotechnical report for the development of the Framework Plan. The report provides an assessment of the geotechnical issues and constraints which will be associated with developing the four precincts of Plummer, Fennel, Montague and Lorimer. The report includes a series of preliminary geotechnical overlays, contour maps, colour coded maps indicating different foundation solutions, and an indicative foundation cost per square metre of floor area that may apply to a range of heights. A number of key constraints have been identified including the strength, quality and thickness of soil, weak surface soil, depth to suitable strata for foundations, and potential for gas build up within the Coode Island Silt. Golder Associates suggest a range of foundation solutions including shallow spread footings, piled foundations for all non-settlement structures, shallow basements for parking or avoiding basement parking, limiting fill placement to less than 0.5m in depth, and recognising the need for height across the precincts to justify build costs. This report has been important in providing the technical underpinning of recommended heights across the urban renewal area outlined in the Strategic Framework Plan. This report assesses the need for community infrastructure in Fishermans Bend, and identifies potential impacts and response requirements of future development under the projected population growth. The report includes a list of community infrastructure requirements over the next 20 years based on four different urban growth scenarios, identifies the timing and staging of these requirements, indicative costing, principles for the provision of community infrastructure and recommendations on the next steps of analysis and deployment. The report includes the projected use of infrastructure such as schools, sporting facilities, and child care and youth services. ASR Research includes a comprehensive list of the required infrastructure and projected uses under these four growth models. This report has been useful in the work for developing a development contributions plan, and floor space ratio controls, as well as in negotiating infrastructure provision by planning permit applications. This assessment investigates the feasibility of development in the Fishermans Bend Urban Renewal Area. As part of the study the theoretical development capacity across the four precincts is analysed and the strengths and weaknesses of the area from a real estate development standpoints identified. MacroPlan Dimasi notes that the area presents great potential for revitalized waterfront and high-tech precinct development and presents itself as a prime destination for well appointed commercial, retail and residential development. Four ‘priority projects’ are suggested which include major retail activity nodes, major commercial developments, major residential developments and a light rail extension into the Sandridge Precinct. The assessment has helped informed precinct planning and the role of the Urban Renewal Area in the central city context. The Existing Land Budget tabulates land use in great detail in a precinct by precinct format and includes the hectares of community and transport infrastructure, developable land and encumbered land for each precinct. It has been helpful in providing an understanding of existing infrastructure and land use, and gaps that are required to be filled. It has been an impetus for the utilities, infrastructure and amenities studies currently underway. The demographic profiling undertaken by Places Victoria is a precinct by precinct breakdown of a variety of indicators such as residential and commercial floor space as well as car parking and density per hectare. It also includes projections and scenario staging which indicates the population and number of dwellings to be delivered over a number of time spans. This work has been built on by since the release of the Fishermans Bend Strategic Framework Plan.